When I heard that Meghan Markle was engaged to marry Prince Harry, I felt a twinge of sad-happy. Of course I would never marry him myself, but I always felt as sort of distant affection for him - my favorite of Diana's sons. However, the real winner in the entire wedding situation is anyone who cared what sort of wedding dress she'd wear, which tiara would grace the head of the newest princess, and above all, what their wedding cake would be like. That gown-veil combo was the ideal cross between Grace Kelly, Maria Von Trapp, and Modern Taste. The tiara was amazing. 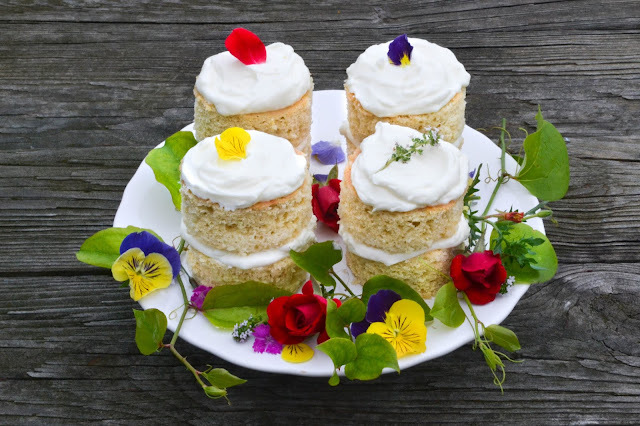 And when it was declared that Claire Ptak of Violet Bakery would be creating a lemon and elderflower cake decorated with fresh flowers, I knew I wanted in! The first combination I tried involved a doctored up version of Sarah Kieffer's yellow cake soaked in elderflower cordial and paired with a tart lemon frosting. As good as it was, I thought the butter + powdered sugar frosting was too heavy, too stodgy, for a cake this ethereal. It wanted something whippy, much more like the Italian buttercream like in that lavender London fog layer cake but I live in Virginia, not the UK, and the weather has recently gone all hot and phlegm-y and is like to stay that way till September or so. 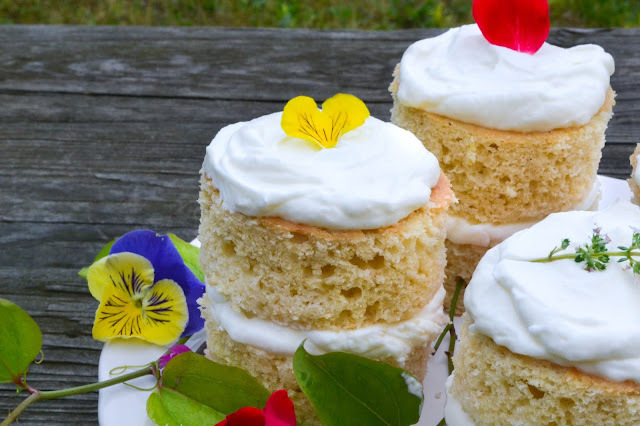 You can't make a meringue-based frosting in sweaty weather. A second reason for needing a frosting revolution is that it turns out there is a time difference between Windsor, England, and Windsor, Virginia which meant that if I wanted cake while watching the wedding, I would be eating cake for breakfast. I mean, I don't usually complain about cake for breakfast but this definitely necessitated that whippy frosting I so craved. Just when I started thinking sordid thoughts like, "Perhaps I'll just make a lemon-elderflower scone..." in swept Yottam Ottolenghi like the sweet fallen angel he is, and Helen Yoh screaming "JUSTICE" at his side. In their cookbook, Sweet, Ottolenghi and Yoh have this charming recipe for a Victoria sponge-based strawberry shortcake. The best part of the entire recipe is this white chocolate whipped cream. I could (and did, once) eat the stuff out of the bowl like vanilla ice cream. So the minute I idly flipped through Sweet again (which has been sitting on my kitchen counter since Mother's Day waiting for me to take notice), I decided to make a lemon sponge, soak it with elderflower cordial, and mix up a floofy batch of that white chocolate whipped cream. Here's the cunning thing about this strategy for Royal Wedding Cake: it's perfect for breakfast because, with the addition of blueberries or a side of eggs and bacon, it's suddenly no longer Dessert Cake, but, like, Breakfast Cake. A proper breakfast cake. 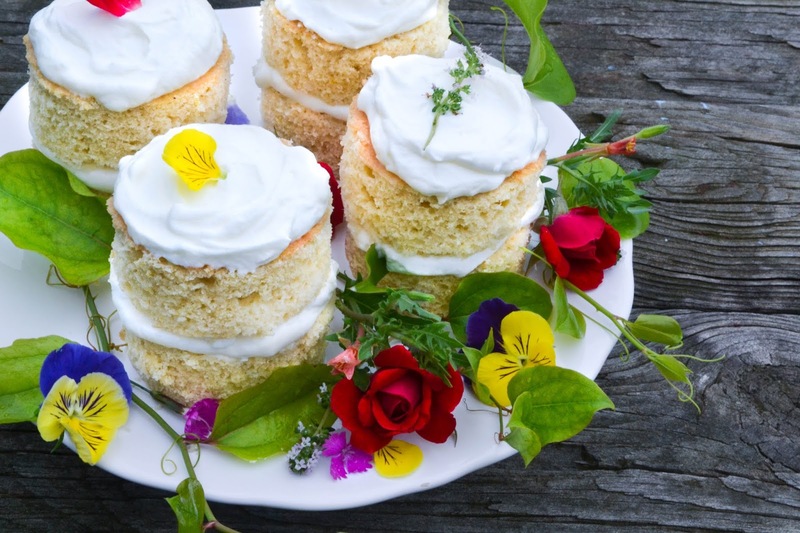 Before even realizing that Claire Ptak would take Meghan and Harry's wedding cake into three separate tiers, it struck me that the only thing better than Cake In General is Your Own Cake In Particular. 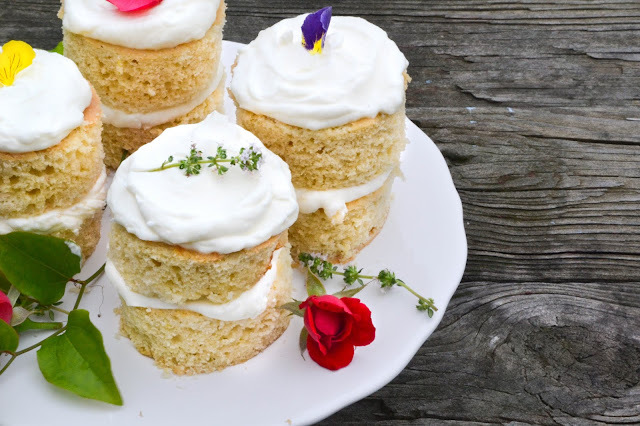 Mini-cakes are an amazing way to get all the grandeur of a cake to yourself without all the "please don't say the word, 'cake' ever again" feeling after you've tried eating a whole one. To make these just the right size, we bake A Cozy Kitchen's lemon sponge in a 9x13 pan and punch out rounds with a large biscuit cutter (to use up the cake scraps I stuffed them into a jar with chopped mango and excess whipped cream and called it "trifle"). Dollops of white chocolate cream separate the layers and afford an airy stability to the cakes, allowing them to be made several hours in advance of eating (I assembled them around 7 PM Friday night and we didn't eat them till 7 AM Saturday morning). 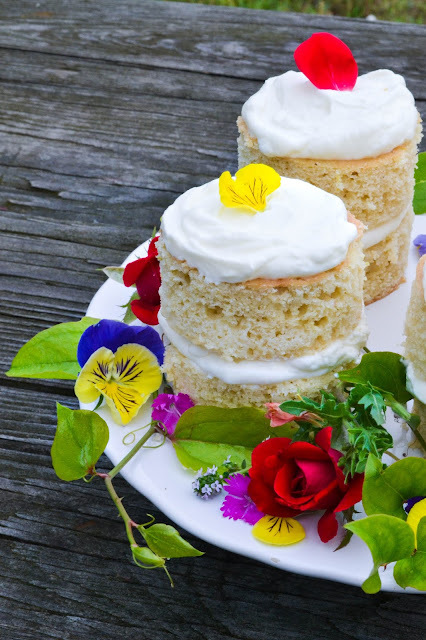 Add a smattering of vague "garden flowers" around the cake plate, then party like you're Bishop Michael Curry. Might as well - those spellbound Brits can't go anywhere till the vows are over and your message needs hearing: love is the way. And cake doesn't hurt either. To make the cake: Heat oven to 350 degrees F. In a small bowl, combine flour, baking powder, and salt. In the bowl of a stand mixer beat sugar and lemon zest together for 1 minute to incorporate the oils from the zest into the sugar. Add butter and beat 2 minutes until fluffy. Add eggs, one at a time, then lemon juice and vanilla. Mix well. Add the flour mixture and mix on low until just combined. Grease, flour, and line a 9x13" baking pan. Spread batter into pan evenly, then bake for 25-30 minutes or until lightly golden and a cake-tester inserted in center comes out clean. When baked, allow to cool for 20 minutes on a wire rack, then flip onto a cutting board and baste with elderflower cordial. When cool, punch out cake rounds with a biscuit cutter. To make the white chocolate cream: Bring 1/2" of water to boil in a small saucepan. In a small bowl set over (but not touching) the water, mix together white chocolate and 1/3 cup of heavy cream till the white chocolate is melted. Cover with plastic wrap and chill in the fridge. When chilled, add white chocolate mixture to a stand mixer and add remaining cream. Beat on high for 1-2 minutes until sturdy but not stiff, as this mixture can quickly over-beat. Assemble cakes by placing a round of cake, dolloping with cream, adding another layer, and more cream. Enjoy! These are lovely, and that icing (I thought icing and frosting was a regional thing, but just looked it up and well, technically its not, but I've always said icing, so) sounds lovely. I'm pretty much a lemons in lemonade only person. I've never tasted elderflower. Those cakes look so good!